BELLEVILLE – The Ontario Ministry of Transportation is planning to add lanes to Highway 401 in the Belleville area. The plan is to widen the 401 from four lanes to six and, ultimately, eight, to handle increasing volumes of traffic. As part of the work, there would be upgrades to the Highway 401 interchanges at Wallbridge-Loyalist Road, Highway 62 and Highway 37, as well as the Moira River Bridge, Potter Creek culvert and Sidney Street underpass. At Monday’s city council meeting, Neil Ahmed from the consulting firm WSP and Glenn Higgins of the transportation ministry presented preliminary plans for the project. The public can see and comment on the plans at an open house to be held Thursday from 4 to 8 p.m. at the Banquet Centre on Alhambra Square. 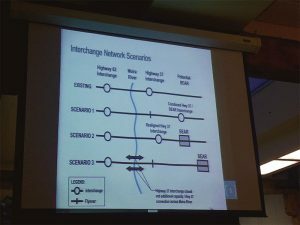 The plan includes various scenarios for the local 401 interchanges, including combining the Highway 37 interchange with a new access road in the eastern part of the city. Some of the overpasses along the highway were built in 1955 and “are approaching the end of their life and need to be replaced,” he said. Asked by Coun. Jack Miller about the project’s time frame, Higgins said the ministry hopes to have the plan finalized by the end of 2018. The public information session to learn more about the project will be held on Thursday from 4 to 8 p.m. at the Banquet Centre on Alhambra Square.